Introduction to Communication Disorders: A Lifespan Evidence-Based Perspective presents recent advances in the assessment and treatment of communication disorders in a highly readable manner. Each chapter is concise, yet comprehensive–striking a just right balance of information appropriate for introductory-level students. Readers gain a basic foundation in the areas of anatomy and physiology of speech and hearing, and an overview of the various disorders that affect voice, fluency, articulation, language, cognition, swallowing, and hearing across the lifespan. Updated case studies, evidence-based practice summary boxes, and new medically based photographs help students bridge the gap between theory and clinical application. The Enhanced Pearson eText provides a rich, interactive learning environment designed to improve student mastery of content with embedded videos, audio samples, interactive application exercises, and self-check quizzes. Note: You are purchasing a standalone product; the Enhanced Pearson eText does not come packaged with this content. Students, if interested in purchasing this title with the Enhanced Pearson eText, ask your instructor to confirm the correct package ISBN and Course ID. Instructors, contact your Pearson representative for more information. Robert E. Owens, Jr., Ph.D. (“Dr. Bob”) is a New York State Distinguished Teaching Professor and a professor of Communication Sciences and Disorders at the College of Saint Rose where he teaches courses in language development and language disorders. He received Honors of the American Speech-Language-Hearing Association in 2015 for his distinguished contributions to the field of speech-language pathology. 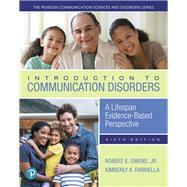 In addition to co-authoring the 6th Edition of Introduction to Communication Disorders: A Lifespan Evidence-Based Perspective, he is also the author of Language Development, An Introduction, the most widely used textbook in this area in the world, Language Disorders, A Functional Approach to Assessment and Intervention, and Early Language Intervention for Infants, Toddlers, and Preschoolers. Dr. Owens has presented over 225 professional papers and workshops around the globe. Kimberly A. Farinella, Ph.D., CCC-SLP is a Clinical Professor in the Department of Communication Sciences and Disorders at Northern Arizona University where she teaches Motor Speech Disorders at the graduate level, and Speech Science at the undergraduate level. She also serves as Clinic Director of the Northern Arizona University Speech-Language-Hearing Clinic, and supervises graduate student clinicians with pediatric and adult clients with various speech sound disorders of neurological origin. She has presented nationally on numerous occasions on the differential diagnosis and treatment of children with severe speech sound disorders. Her research interests include treatment efficacy for childhood apraxia of speech, and the systematic study of the principles of motor learning. 12. Audiology and Hearing Loss — David A. DeBonis, Ph.D.
13. Augmentative and Alternative Communication — James Feeney, Ph.D.